In a mixing bowl beat the eggs with the salt and pepper until it starts bubbling. Beat in the milk, mint, parsley, scallions, and cheese. In a heavy skillet melt the butter over moderate heat. Pelt in the egg mixture and spread it out evenly. 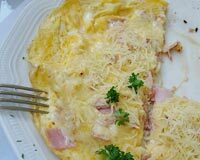 Reduce the heat to low and cover it fully and cook until the edges of the omelet begin to get firm. Uncover and run a spatula around the edges to keep it from sticking to the pan. When the center of the omelet is almost firm, place a plate over the skillet and invert, dropping the omelet onto the plate. Gently slide it back into the pan, cover, and cook for a few minutes longer until the underside is lightly browned. Slide out onto a serving plate, cut into wedges, and serve at once.